please forgive me as I walk on you this day." 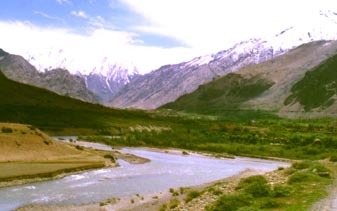 In the Artha-Veda, composed five-thousand years ago by the Rshis, a hymn to the Earth. make a wide world for us. may she spread wide for us and thrive. This earth, our mother, has nurtured consciousness from the slime of the primeval ocean billions of years ago and has sustained the human race for countless centuries. Will we repay our debts to our mother by converting her into a burnt out cinder circling the sun into eternity? Earth is held together and bound firm. Never totter o the earth. The Sun (Surya) is the visible presence, the vision of the Divine, the cosmic symbol for the Supreme. He is the Divine light and presence that fills all the worlds. The Sun of illumination follows in love affair the Dawn (Usha) of awakening. Usha or dawn represents Human aspiration as the Spiritual dawn. 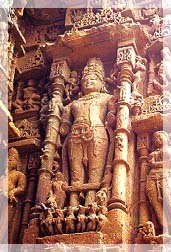 Surya is possibly the most Vedic God. In the RgVeda, he is worshipped as Savitr. As the source of life, light and warmth. He is also the source of inner enlightenment as the famous Gayatri mantra suggests. At dawn, the householder and his wife rise, purify themselves with a bath--usually in a temple pool or a river if one is available--and then make an offering to the fire-god Agni in their household fire. Agni represents the consciousness force, the Sacred Fire. The man will then turn towards the rising sun and ask for blessing and understanding. we offer this prayer to thee. May the radiance of the divine ruler guide our destiny. Wise men salute your magnificence with oblations and words of praise." Lord Rama was also taught, by sage Agastaya, the Adityahridayam, a prayer addressed to the sun god. "The Sun is the foremost physical manifestation of divine creative power. In the glorious morning the faithful bend towards the giver of life in one single gesture of adoration. " In Surya Sahastranam several syno-nyms of the Sun are actually Vishnu’s names and at one place He is also called Jyotirlinga, representing Shiva. Mahakal is both the name of Shiva and the Sun. Ganesha, the son of Shiva, is also represented in the Sun. Image of the rising Sun in a water reservoir or pond appears like an elephant’s trunk due to the ripples, resembling Ganesha. Gayatri and Savitri are forms of the Sun. Aditya is derived from Aditi, which is the name of Durga. The worship of the Sun God means the worship of all the five Puranic gods and goddess. Hymns of the Rig Veda confirm that the Sun is the manifestation of the whole universe. In the Chhandogya Upanishad the Sun has been called Omkar and Udgeet. The Rig Veda says the Sun is the soul of the universe and it controls the animate as well as the inanimate. The Sun’s rays have the amazing power to heal. Sun worship helped Sambha, Krishna ’s grandson, get cured of leprosy. Solar treatment was a well-developed science in ancient times. Its exponents could revive dead persons by concentrating the Sun’s rays on the dead body. Till recently, Swami Viryananda, Swami Dayananda’s preceptor, and Swami Vishuddhananda were experts of this science and reportedly, could perform such miracles. Gopinath Kaviraj has recorded that he himself saw Vishuddhananda reviving a dead bird thus. When Alan Leo, the renowned astrologer, visited India, he was astounded to see the longevity of rural women who ate very little nutritious food. Then he noticed that they wore heavy silver ornaments and concluded that they got solar energy through the silver which probably prolonged their lives. 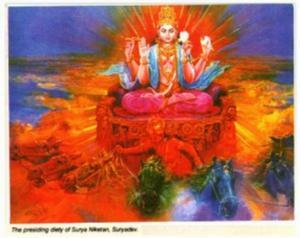 (source: Surya the Sun God, Eternal Healer - timesofindia.com). Copyright © 2006 - All Rights Reserved.